Layout eggplant slices on paper towels, sprinkle with salt and top with another layer of paper towels. Allow to sit for a few minutes. This will remove some of the water from the eggplant and make it more tender. 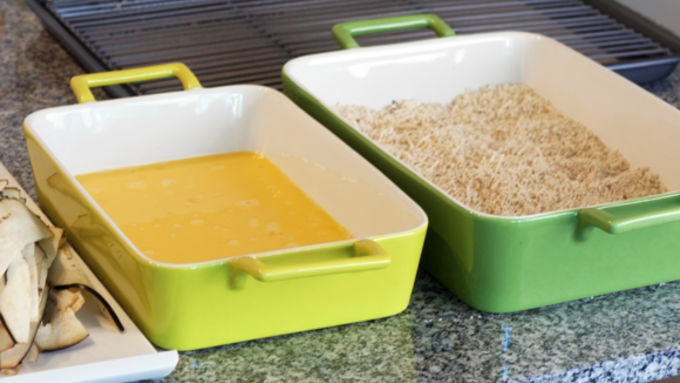 Place a large metal rack on a baking sheet and spray with nonstick cooking spray. In a medium bowl, combine the the filling ingredients – the three cheeses, parsley, salt and pepper. Set aside. In a shallow container, mix together panko, seasoned breadcrumbs, Parmesan cheese, salt and pepper. Lightly whisk the eggs in another shallow container. 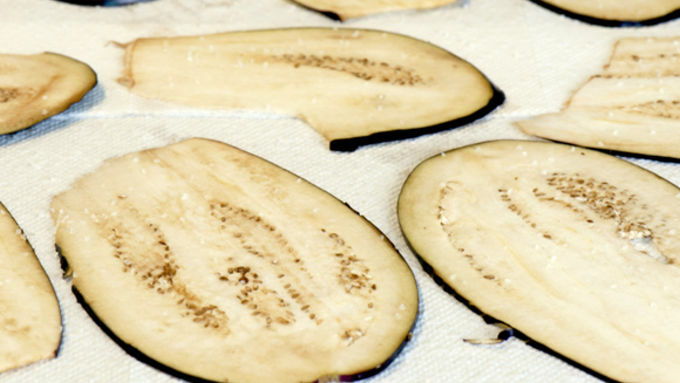 Cut the eggplant slices into thirds, lengthwise – you'll have about 50 full strips. Dip each eggplant strip first into the eggs and then into crumb mixture, coating both sides. Place on prepared baking rack. Bake the eggplant strips at 400°F for 8 minutes, until tender, but not quite golden brown. Allow to cool until you can handle easily. Spoon about a tablespoon of the cheese filling, and roll lightly into a ball. Place on one end of an eggplant strip and roll up. Secure roll with a toothpick. Place the eggplant rolls on a baking sheet and bake for about 5 minutes, until the filling is just warm and the cheese is beginning to get melty. Serve the Eggplant Parmesan Bites with warmed marinara sauce, for dipping. I love Panko bread crumbs–in a completely wholesome and only mildly obsessive way, I swear. 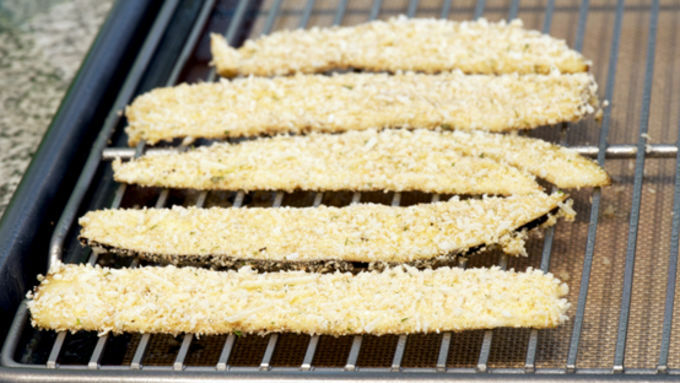 Panko gives even oven-baked foods a satisfying, yet light, crunch. And it makes me forget about deep frying. Most of the time. There’s only one thing I don’t love about Panko: despite its many lovely qualities, there’s no other way to say this–it’s kinda bland. So I’m always rummaging around for additional seasonings to throw into breading mixtures, with wildly varying results. 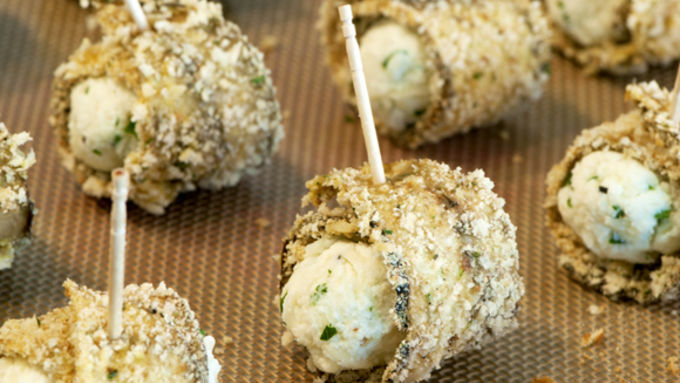 Find the complete recipe for the these Eggplant Parmesan Bits here. Sometimes necessity is the mother of invention: the cupboards were bare And I was running low on just about everything, including Panko. So, I made a breading mixture for my favorite little Eggplant Parmesan bites, using the Progresso Italian Style Breadcrumbs with a half-and-half of Panko and Progresso seasoned bread crumbs. It was perfect – still light and crispy, and the seasoned bread crumbs gave the mixture enough “umph” that it only needed a tiny, wee little bit of salt and pepper (and even I can handle that!). Maybe you all do the 50/50 already, but it had never even occurred to me. As such, I became semi-obsessed, and already have a list of recipes I’m dying to 50/50. First, I’d make chicken nuggets out of this Pesto Parmesan Chicken, do the 50/50 and serve with a Pesto aoli. (Yum!) I’d follow that up with Almond-Crusted Shrimp, maybe using the garlic herb flavor. (Double Yum.) Finally, although I loathe to mess with celebrity chef Michael Chiarello’s recipe, I just might give it a go with these fab Crab Cakes Chairello. (Crescendo of yum!!!) Alright, now that I’ve got that out my system, lets talk Eggplant Parmesan Bites. They’re easy and delicious, and everything you love about an eggplant parm, in a self-contained little bite! 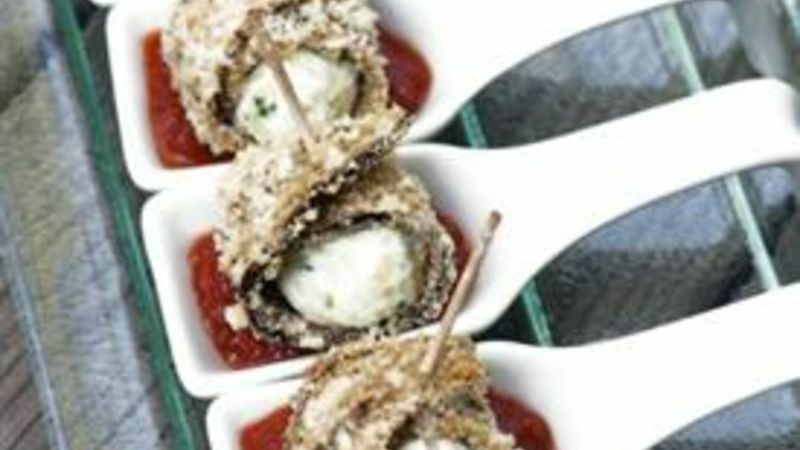 Serve the Eggplant Parmesan Bites with warmed marinara sauce, for dipping. Here are some other fun Panko recipes.